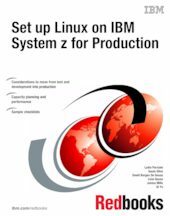 This IBM® Redbooks® publication shows the power of IBM System z® virtualization and flexibility in sharing resources in a flexible production environment. In this book, we outline the planning and setup of Linux on System z to move from a development or test environment into production. As an example, we use one logical partition (LPAR) with shared CPUs with memory for a production environment and another LPAR that shares some CPUs, but also has a dedicated one for production. Running in IBM z/VM® mode allows for virtualization of servers and based on z/VM shares, can prioritize and control their resources. The size of the LPAR or z/VM resources depends on the workload and the applications that run that workload. We examine a typical web server environment, Java applications, and describe it by using a database management system, such as IBM DB2®. Network decisions are examined with regards to VSWITCH, shared Open Systems Adapter (OSA), IBM HiperSockets™ and the HiperPAV, or FCP/SCSI attachment used with a storage area network (SAN) Volume Controller along with performance and throughput expectations. The intended audience for this IBM Redbooks publication is IT architects who are responsible for planning production environments and IT specialists who are responsible for implementation of production environments.